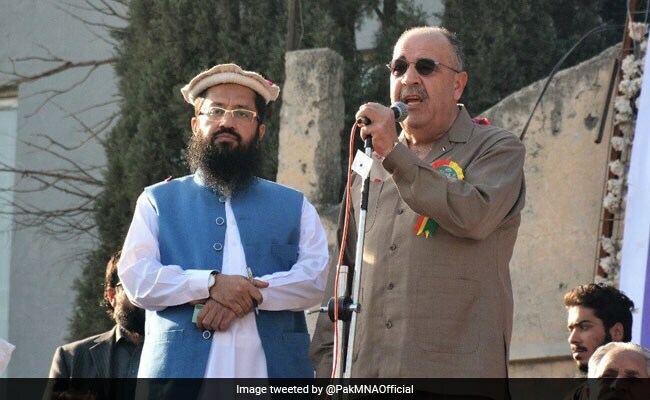 India took strong exception to Palestinian Ambassador to Pakistan Walid Abu Ali sharing stage with Hafiz Saeed, who founded the Lashkar-e-Taiba which is responsible for the 2008 Mumbai attack. Hafiz Saeed and Palestinian Ambassador to Pakistan Walid Abu Ali participated in a rally in Rawalpindi. Islamabad: Pakistan on Saturday defended Mumbai terror attack mastermind Hafiz Saeed's participation in a pro-Palestine rally, saying the JuD chief's UN proscription does not place any restrictions on the freedom of expression. Saeed and Palestinian Ambassador to Pakistan Walid Abu Ali participated in the rally in Garrison city of Rawalpindi yesterday. India took strong exception to Ambassador Ali sharing stage with Saeed, who founded the Lashkar-e-Taiba which is responsible for the 2008 Mumbai attack. Pakistan Foreign Office in statement said the country's unambiguous and steadfast support to the Palestinian cause was well known and several rallies had been held since the US announced to recognise Jerusalem as capital of Israel. "The Ambassador of Palestine has participated in many of these meetings. The public meeting held yesterday was yet another demonstration of the Pakistani strong sentiments in support of the Palestinian cause," it said. "This public rally was attended by thousands of people from all walks of life. More than 50 speakers addressed the rally, including Hafiz Saeed. Contrary to the impression being created, UN proscription does not place any restrictions on the freedom of expression," the FO said. It said Pakistan has always supported the two-state solution. "The people and Government of Pakistan respect the Palestinian Ambassador's active participation in events organised to express solidarity with the people of Palestine," it said. Saeed, who was among the speakers, accused Jewish, Zionists and Hindu leadership of destroying the world peace. He urged the Muslim countries to send their armies if the US moved its embassy to Jerusalem.